Centuries ago, in a sector that would later become part of the Dirac Legature, two neighboring worlds launched their first fully automated, self-repairing deep space probes. The first, from a peaceful world of culinary-minded hexapods, was tasked with finding and learning from other civilizations, and returning to the world of its creators with recipes from the stars. The second, from a system until recently wracked by interplanetary war, was programmed to gather and destroy deep space mines, automated weaponry, and other warlike technology. Unfortunately, as both probes strayed ever further afield in fulfillment of their mission, they were pulled through the The Eye of Xaphor and emerged in a far corner of the galaxy. There, highly damaged by their voyage through internodal space, they were intercepted by a technologically advanced and well-meaning exobiologist, who repaired the damaged machinery and sent the probes on their way. The programming of the probes, however, was unintentionally garbled in the process, and the resulting probes bore core programming far different from their predecessors. The first now sought out and destroyed weaponry, returning to their places of origin with interstellar recipes. After simultaneously ending a major interplanetary war and beginning an interplanetary baking competition, the probe was memorialized in a shrine to peace. The second, however, was now tasked with finding and learning from deep space weaponry while gathering and destroying other civilizations. It slowly made its way through the galaxy, absorbing military technology and leaving a path of destruction in its wake. Now, known as the Omega Singularity, it and a fleet of attendant technological constructs has returned to the galactic core, threatening all civilization with destruction. 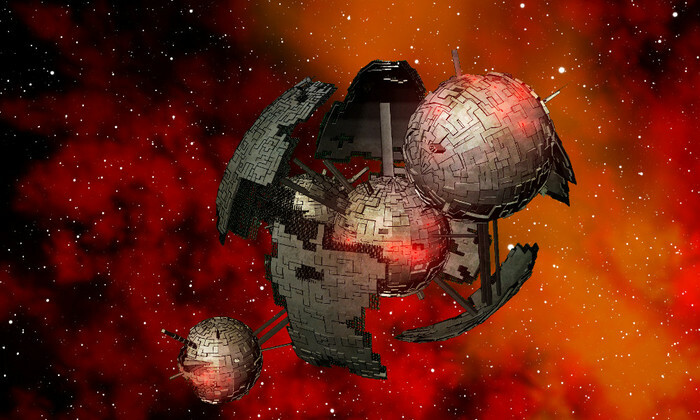 Programmed to find and learn from deep space weaponry while gathering and destroying other civilizations, the Omega Singularity and its fleet of attendant technological constructs is slowly making its way through the galaxy, absorbing military technology and leaving a path of destruction in its wake.